When it comes to real estate tips and tricks, there are tons of great articles and content available for first time home buyers. 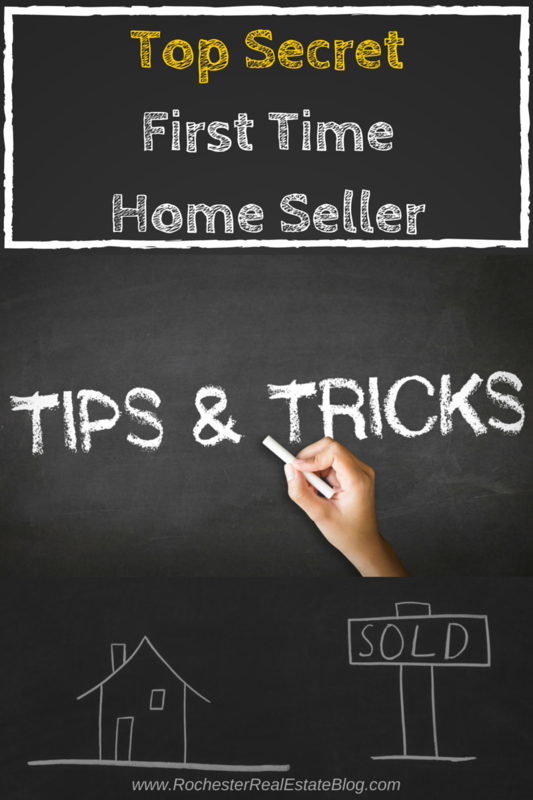 The same cannot be said about tips and tricks for first time home sellers. When the decision is made by a first time home seller to list their home for sale, there is often a period of confusion. Most first time home sellers have no idea where or how to start the home selling process. It’s very important that first time home sellers understand what the home sale process entails, what costs are associated with selling a home, and many other very important aspects of the home selling process. Before you sell your home for the first time, make sure you check out some of the most important first time home seller tips and tricks below. By following these tips and tricks, you will put yourself in a much better position to sell your first home and will make the home selling process seem rather easy! One of the biggest mistakes made by first time home sellers is that they do not know how to or understand how important it is to prepare a home for the open real estate market. Before selling a home for the first time, it’s important you realize how important it is to make sure your home is show-ready as soon as it’s listed for sale. One of the biggest suggestions for any first time home seller is having a home inspection completed before the house is listed for sale. The likelihood that a home buyer will decide to have a home inspection is very strong. Today’s home buyers are scared away from homes relatively easily and correcting problems that an inspector finds before listing your home for sale can greatly decrease the chance that a deal may fall apart due to a buyer getting scared off. It’s important that first time home sellers understand the importance of making a great first impression on potential home buyers. By not properly preparing a home for sale, a first time home seller could potentially be costing themselves thousands of dollars and also valuable time, in the event their home takes longer to sell. Hire A Top Realtor When Selling A Home For The First Time, Not A DUD! First time home sellers need to understand the importance of having a top producer representing them during the sale of their home. Selling a home is not an easy task, so don’t attempt to sell your home by owner. For sale by owners, also known as FSBOs, have a failure rate of 85%-95%. In any given real estate market, there can be several hundred to several thousand real estate agents who have the ability to sell a home. It’s important that first time home sellers understand that not all real estate agents are the equal. Even real estate agents within the same company are not equal. Some real estate agents are part time real estate agents, some are primarily buyers agents, and other agents may only have had their real estate license for a month or two. How can a first time home seller ensure they hire a top producing listing agent? It’s actually a fairly simple answer, you know how to properly interview real estate agents. A first time home seller who knows how to properly interview prospective real estate agents will have a much greater chance that they hire a top producer and not a dud. It’s important that first time home sellers don’t always assume that the real estate agent who sold them their home is capable of selling the home. There are several things that home sellers should expect from their real estate agent when selling their home. Some of the things a top producing listing agent will provide to a seller may not be able to be provided by the buyers agent who sold them their current home, such as a comprehensive marketing plan. Real estate markets can vary significantly from one neighborhood to another. First time home sellers need to understand what the current state is of their local real estate market. Generally speaking there are three “states” of a real estate market, a sellers market, a buyers market, and a balanced market. Some real estate markets will vary depending on the time of the year, for example, typically during the spring months of April, May, and June, the Rochester, NY real estate market experiences a strong sellers market. Since the spring months are typically stronger months to sell a home, many home owners have to decide whether they should list their home in the fall and winter months or wait until spring. Obviously a sellers market is preferred when selling a home for the first time. A sellers market typically will lead to lots of demand for a property and the possibility of receiving multiple offers. Before you decide to sell your home for the first time, it’s important you ask a real estate professional their analysis relating to the current state of the local market! First time home sellers often neglect to figure out what their next move is after selling their current home. Will you move into an apartment? Will you be buying a new home? Will you be building a new home? It’s important when selling a home for the first time, you have a strong game plan for your next move. If the game plan is to purchase another home, a first time home seller needs to determine whether they can get pre-approved for a mortgage without being contingent on the sale of their current home. While it’s uncommon in most cases that a buyer is able to purchase a home without selling their current home, it’s extremely important to know. Buying and selling a home simultaneously can be tricky and it’s important that a game plan is in place if this your next move! First Time Home Sellers Need To Understand The Importance Of Correctly Pricing Their Home! The number one reason a home doesn’t sell in real estate is because the property is incorrectly priced. There are lots of different reasons why home owners incorrectly price their home and it’s important the first time home sellers don’t make those common real estate pricing mistakes. First time home sellers often have no clue on how a listing price is determined in real estate. There are many different ways a listing price can be determined and it’s important that you understand the various ways. The most common real estate pricing practice is a comparative market analysis that is completed by a real estate professional. A comparative market analysis, also commonly referred to as a CMA, can be summarized as a review of local active homes for sale, past home sales, and also past expired listings. A top producing real estate agent should be able to determine a probable sale price of a home by completing a detailed market analysis. While a CMA is the most common way to determine the price of a home, another accurate way to produce a listing price of a home is by having an appraisal completed on the property. It’s critical that first time home sellers avoid some of the inaccurate ways to price a home, such as using the homes assessed value or using an online home valuation estimate, such as Zillow’s “Zestimates.” There is no possible way an online website based out of San Diego, CA can accurately determine the price of a home in Webster, NY. First time home sellers are often shocked when they learn about the seller expenses that they traditionally are responsible for. One of the hardest pills to swallow for a first time home seller are brokerage fees. First and foremost, real estate commissions are negotiable. First time home sellers often forget that the previous owner of their current home paid the brokerage fees when they purchased their home. Brokerage fees are normally the largest expense incurred by a home seller. Other home selling expenses that first time home sellers need to consider include the cost of an instrument survey, re-dating of an abstract, transfer taxes, and also the possibility of helping a buyer out by contributing a seller concession towards their closing expenses. When selling a home for the first time it’s important to keep an updated mortgage pay-off balance handy, if applicable, so when a purchase offer is received you can determine what your closing expenses will be and there are no surprises a few days before closing. Selling a home for the first time can be extremely stressful and exhausting. A first time home seller who has a top producing agent in their corner will have a much greater chance of a smooth and successful home sale. The above tips and tricks are some of the most important for any first time home seller. Make sure when selling your home for the first time you’re mentally prepared for the possible upcoming home selling challenges that you may encounter. Are you a first time home seller in Rochester, NY? If so, make sure you take good note of the above tips and tricks. By following the above tips and tricks, selling your first home will seem much easier and less stressful! If you have no selected a top Rochester, NY Realtor to represent you in your home sale, contact me, and I’d love the opportunity to interview for the opportunity to get your home sold! About the authors: The above article “First Time Home Seller – 6 Tips And Tricks For Selling Your First Home” was provided by Kyle Hiscock of the Hiscock Sold Team at RE/MAX Realty Group. With over 35 years combined experience, if you’re thinking of selling or buying, we’d love to share our knowledge and expertise.